NASA’s newest Solar Observatory, the Interface Region Imaging Spectrograph – IRIS, has provided its first-light image of the Sun’s atmosphere and Interface Region. The first images of IRIS were taken less than one month after its launch atop a Pegasus Rocket as part of regular spacecraft commissioning that will be ongoing for the next four weeks. Following its flawless launch and orbital insertion by the Pegasus Rocket early on June 28 (UTC), IRIS began on-orbit commissioning. Early operations completed in the first minutes after S/C separation included Solar Array Deployment and Sun-pointing attitude acquisition. Following the initial health checks, IRIS entered the first half of its 60-day checkout phase. The first 30 days were planned to be dedicated to basic vehicle checks to make sure all systems were functional and properly configured. The second half of the checkout period is dedicated to calibrations of the instrument and also features initial observations. The first big milestone of the mission came on July 17 when the IRIS Spacecraft opened the protective cover of its telescope. The telescope is equipped with a front door based on the Solar Dynamics Observatory design to protect it from contamination on the ground and during early orbit operations. The front door has a single use redundant wax actuator assembly as opening mechanism. Opening of the door was completed without issue – enabling IRIS to open its eye to the Sun. When the door was opened, IRIS began to acquire its first light images. Images that were downlinked to Earth were of great quality showing the Sun’s lower atmosphere in never-before-seen detail. The first image released by the IRIS mission compares a frame acquired by IRIS with an image of the same region of the Sun taken by the Solar Dynamics Observatory. The image shows exceptional detail of the multitude of thin, fibril-type structures that have never been seen in that form before, representing large contrasts in density and temperature in this region. Neighboring fibrils are only separated by a few hundred kilometers. “The images also show spots that rapidly brighten and dim, which provide clues to how energy is transported and absorbed throughout the region,” NASA said in a statement. IRIS will examine how solar material moves, gathers energy, and heats up as it travels through a little-understood region in the sun’s lower atmosphere, the chromosphere, to the corona. Observing how material and energy move through this region will provide more insight into the dynamics of the Sun to help explain what causes the ejection of solar material, in the form of the steady solar wind or larger, explosive Coronal Mass Ejections – that influence near-Earth space weather. 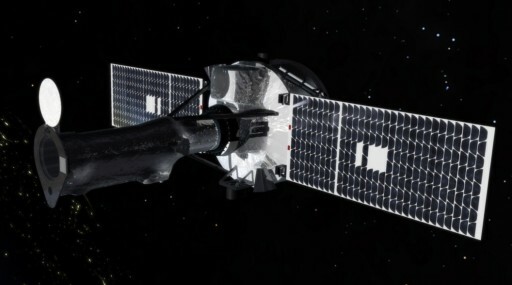 As a Small Explorer Mission, IRIS has an overall budget of $120 Million. Lockheed Martin Solar and Astrophysics Laboratory in Lockheed’s Advanced Technology Center is the principle investigator institution and overall responsibility for the mission while Lockheed Martin Civil Space, NASA Ames, Smithsonian Astrophysical Laboratory, Montana State University, Stanford University and the University of Oslo are contributors.